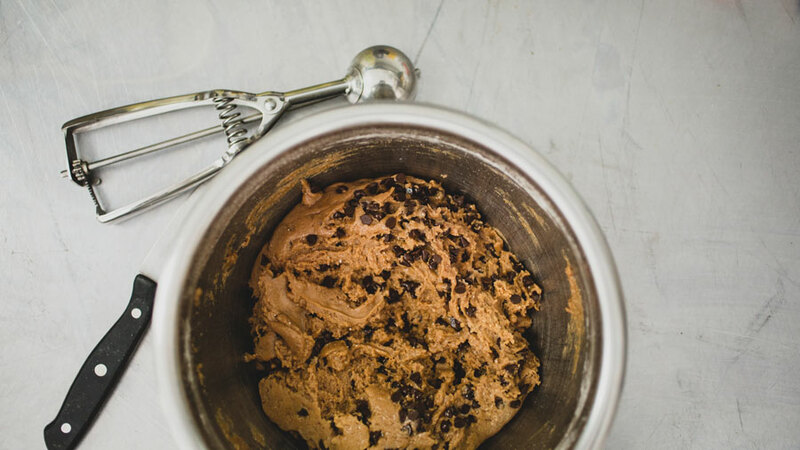 The popularity of Jason Mercado's simple, yet delicious cookies have reached Hollywood for Oscar parties and have even been served at the BET Awards, but their path to popularity was different than the norm. Mercado doesn't have a business degree, and is not a trained chef — he credits his talent to The Food Network and Google. "This is what was supposed to happen. I was supposed to bake those cookies at 11, I was supposed to go to jail, I was supposed to be an addict — because everything I've done now, has gotten me where I'm at in my life." Now at 44 years old, and more than a decade sober, Mercado owns a successful cookie and dessert company, Sweet Mission Cookie Co. Unfortunately, the cookie didn't always crumble so perfectly. In 2013, Jason moved from Philadelphia to California — flat broke, a drug-related felony on his record — just to risk starting his own company, under the most unstable circumstances imaginable. "I started the company when I was homeless. When I left Philadelphia, I had backpack full of clothes, a duffle bag full of food and $60 cash in my pocket." Homelessness is a real issue in our society. While mental health and addiction can directly contribute to individual situations, Mercado's story illustrates the difficult circumstances average people can face when struggling to find employment, pay rent, and make ends meet. It's easy to dismiss the real issue, but regardless of an individual's level of homelessness, the problem still exists. Mercado never spent time panhandling, or begging, yet his story showcases how easily individuals can slip through the cracks without a proper support system. At 40, Mercado was laid off from his managerial position at Starbucks. He found himself living on the streets of Philadelphia, a city he had called home for more than a decade. In order to survive, Mercado joined the Occupy Philadelphia movement. Although he wasn't politically motivated, he didn't want to miss his only method for survival. His imposing 6' 3” frame arrived at the Occupy encampment, about three weeks after the Philadelphia 99 percenters had started to stage their protests. Mercado recalls seeing waves of people spilling onto the front lawn of Philadelphia City Hall, building makeshift shelters, dropping off food, clothing, and other goods to help sustain those protesting inside this giant tent city. "For lack of a better term, I was an occupier. I slept in a tent — actually I slept in a tent with two other people. This is on the grounds of Philadelphia City Hall, not the back, the front of City Hall. It was crazy." It was through this chaos where Mercado found time to ideate a plan for his own cookie business. Mercado explained that while living within Occupy, his day to day activities went along normally. He admits there was probably people he met on a daily that had no idea he was homeless. "As far as living in the tent, probably about 2 and a half months, maybe a little less time. I think at the time I was stuck on the idea of starting this business, I went about my daily life, just without a permanent place to stay." However, even during this politically charged protest underway, Mercado admits some of the Occupiers became less and less concerned with the movement. As a recovering addict, he admits seeing drug and alcohol use throughout the encampment. Although he abstained from using, Mercado said he felt Occupiers had lost their focus and the concept of the Occupy movement began to dissolve. "I think when it first started, it was a real cause for it. I think as it went along, it drifted. It transitioned from Occupy, to almost like a party atmosphere. To be honest, it didn't bother me, because I already knew what I wanted to do." While living as an Occupier, Jason was told about an extended education class, offering a course on business startup basics. He knew very well he wouldn't be able to pay the fees — but he enrolled without hesitation. "I didn't have the money at the time, but something just told me, 'Just sign up.'" With a bit of luck, he secured a scholarship with the program and was able to get his fees waived. Still he needed more room to bake. 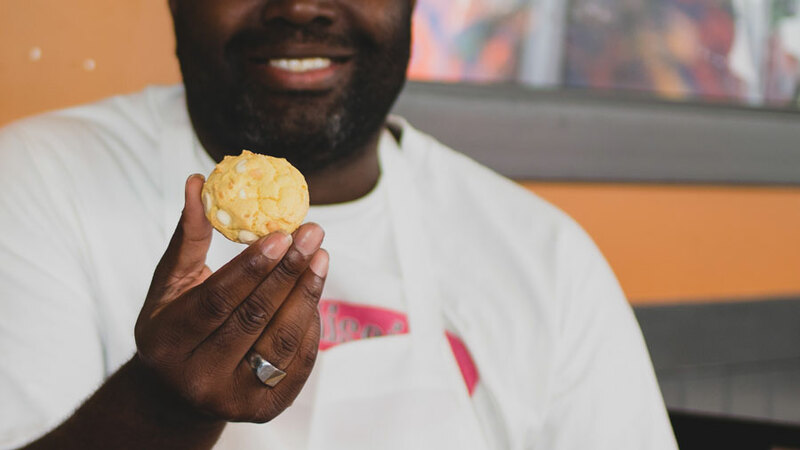 While living in homeless shelters and using local kitchen space to bake, Mercado started gaining notoriety by selling his cookies under the company name, 'Just Cookies' in Philly. He had saved up to about $2,000 when he was ripped off by a business partner. Floundering at this point, he tried to secure a loan, but was denied. Mercado then headed to California for a fresh start. He found a sober living home in Huntington Beach, Calif., where he found a job as a dishwasher at Taco Bell, then located a humble commissary kitchen space to bake cookies in. About four months after arriving in California, he received a phone call from someone who found him on Facebook, wanting to hire him for what he would pleasantly find out to be a pretty special event. "I was invited to do an Oscar's post-party at the W Hotel in Hollywood. I was shocked but had my guard up at the same time. I didn't even know where I was going to bake at." The order required at least 1,500 cookies. With a little extra help, he baked 2,500. Later that year, Sweet Mission Cookies was booked for the BET Awards. Local press started noticing Mercado's story shortly after and the rest is history. Now, three years after arriving in California, Mercado still works part time at Taco Bell, the place that gave him his first California paycheck, with the alternative of Sweet Mission Cookie Company’s continued growth. He operates his cookie business out of the 4th Street Market in Santa Ana, Calif., where he works as The East End Kitchen Coordinator and Event Planner. However, the way he makes his money is different than how he makes a living. Mercado bakes to inspire others. He sees the shape of a cookie as a metaphor. To him, it's a personal philosophy for 'completeness'. It has now become his mission to help others who may find themselves struggling, like he was, to find their path off the streets. 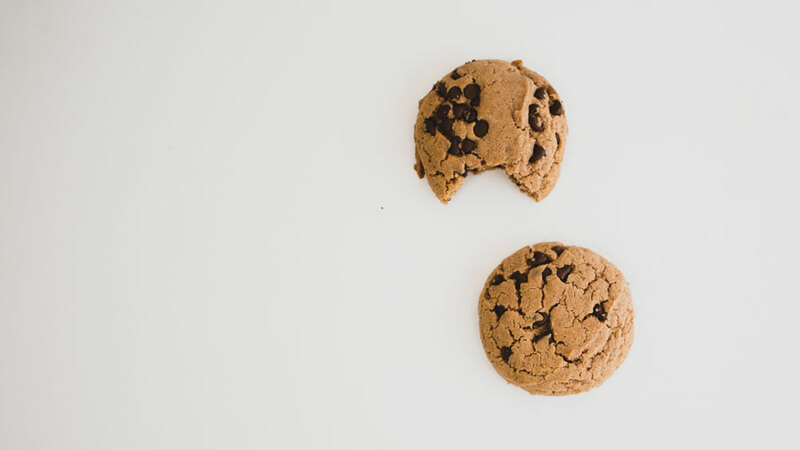 "I always tell people, 'A cookie is round and it represents 'completeness' — being able to make a complete turnaround, starting over again." Mercado does not take his success for granted and is dedicated helping others. Currently he is working to form a non-profit, aptly named, The Sweet Mission Project, which hosts pop-up meals that feed the less fortunate. The casual optimism that Mercado exudes showcases his drive to accomplish great things. He's thankful for his experiences, and accepts that not everything is meant to be mainstream. "I created my destiny — against being an addict, against being homeless, against the bank — I stuck with what I believed in and as long as I had that belief in myself, I knew it was going to work." As a one man team, Mercado does not rate his success by monetary units. He carries a larger than life attitude with a kind, but determined work-ethic and modest entrepreneurial attitude. The term 'trailblazer,' according to the Merriam-Webster dictionary, is defined as, "a person that makes a new track through wild country. A pioneer, or an innovator." Mercado is such, a living example of what can be accomplished when sacrifices are made. He also lives to empower and inspire. Moreover, Mercado is a survivor who is still working to give back to the community that has enabled him to accomplish his goals.